Just recently, an animated video was released explaining the plight of the bluefin tuna. The graphics were great, storyline smooth, and all around it was sharp. Too bad, though, because it was way off on the most important facts. The following innovative video was created by the founders of a new project based in Belgium called howtosavethebluefin.com and provides a solid background on the history, politics and economics behind the blue fin tuna crisis. It even appears that the video and makers are getting attention in the mainstream press. Come on, my fellow bloggers, you should know better!!! Yes we need to save the bluefin, but shaky arguments are not the way! To straighten it all out, I’m going to do a little fact check for the bluefin blogosphere. The focus on the Mediterranean, ICCAT, and the suggests that the video is talking about Atlantic Bluefin tuna. That species has been getting a lot of press in recent years because ICCAT, its management organization, has not been doing its job. 2). The video states that bluefin has declined by 97% from its pre-fishing levels. Again, wrong. If we are talking Atlantic bluefin, then ICCAT’s science committee wrote in October 2009 that the present biomass is below 15% of the virgin biomass. Very low yes, but not 3%. The 2009 ESC meeting reported the status of the SBT stock in 2009 based on the reconditioned CCSBT Operating Model (OM). The reference set OM and six plausible scenarios all indicated that the spawning stock biomass (SSB) remained at a very low level; typically about 5% or less of SSB0. Finally, the Pacific bluefin could be in an even worse state, but there aren’t any reliable estimates out there (from what I can tell…the Pacific isn’t usually in my “bag”). At its peak, between 1997 and 2007, more than one in three bluefin was caught illegally, creating an off-the-books trade conservatively valued at $4 billion. Since 2007, it is believed that the illegal fishing has gone down some. I recommend reading the entire ICIJ report because it nicely details the pillage that was and, to a serious degree, still is happening. 4). “The last bluefin will be caught in 2012.” Honestly, I have no idea where the video authors got this. Of course its possible, but mortality for the Atlantic bluefin seems to be falling a little in the Eastern stock, while the Western stock is fairly stable, though very low. 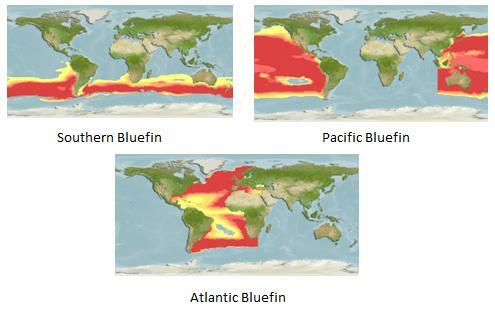 More at risk are the Pacific and Southern bluefin, but even there we’ve never heard 2012 as the year it all could end. So bluefin blogosphere, there you have some serious misinformation (plus a few other bad bits I didn’t mention). As part of this beautiful community of online writers and as part of the conservation movement, we shouldn’t be so quick to pass on junk. As for our advertising students, they’ve clearly got some real talent. Maybe they could hire an expert to consult them? Or maybe just go work for a larger outfit that could benefit from such clever digerati? And last of all, I really hope these guys steer away from this apparent plan to ‘intervene’ in poaching activities. As I wrote in a recent post, illegal fishers are not just some schlubs stealing fish, but rather real and potentially dangerous organized crime networks. This is likely to be especially the case for bluefin since they are worth so much.